A.M. Ran with Jeff. We ran into a few BYU guys who were warming up for a tempo, ran with them for a bit less than a mile. They helped us catch the 8:00 guy. Then we bummed the rest of the way at a bit faster than 8:00. I did explosions. Jeff was concerned about his knee and did not want to do the fat miles. Then some bikers passed us, and I was able to talk Jeff into doing one fat mile. The excitement of the bikers was too much for him, and we opened with a 38 200 AFTER I had warned him that the pace was too fast. We still ended up with a 5:16 mile, HR got up to 162, not a fat mile at all. We were rewarded for our speeding by passing an old guy on a tricicle. The ladies gapped us. A lesson in humility. Do not mess with bikers. Finished 10.1 in 1:15:21. Then 2 more with Benjamin in 16:26. Then 64 foot one leg sprints: right - 6.4, left - 7.1, right - 6.2, left 6.5, right 5.9, left 6.4. P.M. Ran 2 with Jenny in 19:08. Julia did the first 1.5 in 14:22. Then 0.5 with Joseph in 5:33. A.M. Progression tempo run with Jeff. I like the Russian word for it - в раскрутку, or literally with a spin. The plan was 90-89-88-88 (5:55)-87-87-87-87 (5:48) -86-86-86-86 (5:44) -85-85-84-84 (5:38)-77-77-77-77 (5:08) - 28:13. Yes, I got nerdy enough to plan every quarter of it. The purpose was to get some marathon pace running, help Jeff feel his 10 K pace, and see how long I could run 5:08 pace at the end of it up a small grade. It went fairly close to the plan. 90 - 89 - 87 - 88 (5:54) - 87 - 87 - 86 - 88 (5:48, 11:42) - 86 - 86 (14:34) - 86 - 84 (5:42, 17:24) - 86 - 83 - 84 - 83 (5:36, 23:00) - 78 - 77 - 80 - 81 (5:16) - 28:16.2. Yes, I am nerdy enough to remember every quarter split without the use of the split button. Because every one of those quarters has a special meaning that extends beyond the number. Jeff's last two quarters were 78 and 76 with the mile in 5:09. The first quarter of the last mile was just perfect. Then we lost the momentum a bit, and Jeff pushed to regain it. Pacing on that stretch is difficult. This little surge was too much for me. After the first half mile I started losing it and around 1 K into the mile told Jeff to go. I still managed to stay at a little slower than 5:20, but did not have the leg strength to run faster. Was happy to have edged out the 5:30 guy for the last 2.5 by three seconds (13:42). Here is what's interesting. HR maxed out at 167, but dropped to 164 after I had slowed down to 81 second quarter pace. More evidence against lactic acid being the performance inhibitor as if we needed it. I believe the fatigue mechanism is the same as when you drop a book after holding it with your arm straight for a couple of minutes. At least that's what it feels like. Jogged back to the house, then I ran 2 with Benjamin in 17:33 and a quarter in 85. P.M. 2 with Jenny in 17:52. Julia ran 1.5 in 13:24. 0.5 with Joseph in 5:32. A.M. 10.1 with Jeff in 1:12:59. Did explosions. No fat miles, resting for DesNews 10 K.Started out slower than 9:00 in the first mile, then sped up to 8:00, then ran sub-7:00 the rest of the way because Jeff needed to get to work. HR was around 132 at 6:40 pace, 126 at 7:00. Discussed a training idea - one week of 5 mile tempos at 6:00 pace every day followed by two normal weeks. I tried three weeks like this in 2006 aggravated by Wasatch Back Ultra in the middle, and it gave me neural fatigue at the end. However, a week later I ran a PR for the 3 mile downhill Provo Canyon tempo (15:15), had a decent performance in Draper Days (16:00 on the old course), and did not totally lose it in DesNews (2:31:47). After DesNews I had severe neural fatigue for a while, but then recovered to run St. George in 2:25. So a milder version of this, backing off timely, might actually work. The theory behind it is to make the slow twitch fibers work very very hard to cause myofibrillar hypertrophy. That is the type of hypertrophy that gives the muscle the strength without the volume, exactly what a runner would need. Nobody quite knows how to do it yet. I think the consensus is that you cannot do it. Fast twitch is easy - weight training, 90-100% of the max reps. Slow twitch does not do it. But maybe it can. You just have to pick the right volume, frequency, and intensity. Possibly you need to have enough aerobic support in the muscle itself and in the cardiovascular system, and be healthy otherwise to even be able to train at that load without getting injured. Which would make it next to impossible to scientifically prove unless you really really know what you are doing. Ran 2 with Benjamin immediately after in 17:19. P.M. 2 with Jenny in 18:06. Julia ran 1.5 with us in 13:33. 0.5 with Joseph in 5:10. A.M. 10.1 with Jeff in 1:12:31. Did a quarter that was supposed to be Jeff's 10 K pace, but ended up a little faster - 74. Then 2 with Benjamin in 16:42, last 100 in 19, and 2 with Jenny in 19:04, Julia ran the first 1.5 in 14:24. 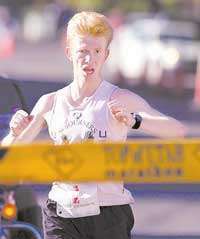 A.M. Deseret News 10 K, 32:31.7, 30th place. Yes, 30th, and triple-chicked! Last year I would have been safe. So I thought sub-33:00 will preserve me from the embarrassment. But this year we had two Kenyan ladies - Hyvon Ngetich and Caroline Rotich, and then Lindsay Anderson and Lindsay Dunkley had break through races as well. I barely beat the slower Lindsay, so 4th place among women. I suppose I can use running Five Fingers as an excuse, but in all honesty if it did make a difference at all it may have saved me the disgrace of local chicking (32:22), but Ngetich would have still chicked me with this effort. My only defense is that I did not get chicked from behind - the speedy ladies just took off and I could not catch them all. The reason I ran the 10 K this year was that I did not want to run in shoes, and did not feel confident I could handle the marathon course in Five Fingers. Plus I did not want a marathon in my legs at this point in my training. Running in Five Fingers presented a problem with the chip. Sarah solved it for me by sewing a special ankle velcro strap with a velcro-locked pocket. It worked out perfectly. Did not bother me at all, the chip never was under any threat of falling out, the strap stayed on. We did have to call Kurt Black to find out the exact dimensions of the chip to get it right, though. At the start everybody took of like a bat out of a hot place for sinners. Maybe because it was rather warn - temperatures in the high 70s. I found myself in mid-pack of sorts through about a quarter mile. That is not too abnormal. However, one mile into it I was still into heavy mid-pack in spite of running 4:51. Downhill, but with the adjustment it was probably worth about a flat 5:15. In a 10 K! And then I did not pass a whole lot of people in the second mile in spite of running it in 4:52 (probably 5:15 flat equivalent). 9:43 at 2 miles. Then I could not believe my eyes. After that effort I see what looks like a girl about 100 meters ahead of me. It was really a girl, not just some weird high school runner with a ponytail that is trying to send some sort of a weird message. She turned out to be Lindsay Dunkley. I did not recognize her. Now that is embarrassing. Not only are you getting chicked, you do not know who you are getting chicked by! Putting things in perspective - a mom of three kids just put a 100 meter gap on me in the first 2 miles of a 10 K while I had just run an equivalent of a flat 10:30 2 miles! Third mile had a net down with some significant up. I ran it in in 5:24, 15:07 at 3 miles. Probably worth around flat 5:30 . Made zero dent in the gap with the group ahead of me. However, some high school runners have been falling off the pace and I was passing them here and there. However, there have been a couple of smarter ones that have started a bit slower and were now passing me. 5:17 in 4th mile, 20:24 at 4 miles. Probably worth a flat 5:30 again. Gradual downhill, no up. Happy that I found another mile at sub-5:20 in me. Reduced the gap in about half. Not looking forward to the next two miles fearing that I would slow down a lot. Trying to relax and not go into neural red zone. I know very well what happens when I do. When you are limited by oxygen, you go into the red zone, then you ease off for a minute or two, catch your breath, and you get back to pace. If you go into the red zone neuromuscularly for as little as 40 seconds, you never get back to pace, and you have absolutely no kick. This took some self-control, as breathing wise I feel like I am bumming it, and when racing I prefer to breathe on the verge of vomit. In the fifth mile I came up on the group I was chasing, which by now had caught Albert Wint. A small consolation - I might get chicked, but at least I will beat Albert today. No split, missed the mark. In the last mile I ran with Brad Perry - a Box Elder High runner, and Lindsay Dunkley. I saw a Kenyan woman - Caroline Rotich - fall off pace and start coming back to us. And further ahead there was another white woman - turned out to be Lindsay Anderson. I did not realize the woman's leader was a good minute ahead and was hoping to unchick myself completely. So I pushed as hard as I could, but so did everybody else around me. Alexander Thomas appeared out of nowhere, and passed us slowly. That was odd. He must not have been having a good day, he should have been about 2 minutes ahead. A couple of high school runners came from behind and demonstrated with their kick that they could with some training run this course under 30:00. Ben Van Beekum passed me, but then I was able to gain on him and almost outkick him, but he edged me out at the finish. Caroline kicked pretty hard knowing that if she got passed she'd be going home empty-handed, and was able to stay in 3rd. That kick was also good enough to keep me from reducing my chick count. Hyvon Ngetich got 31:30, then Lindsay Anderson 32:22, Caroline Rotich 32:28, and Lindsay Dunkley 32:37, a major breakthrough. It is odd that I am reporting on the women's race today, but, hey, I report first on the one I watched! In the men's we saw 27:46 from an Ethiopian runner Alene Reta. To give you an idea of the depth of the field, Teren Jameson finished 8th with 29:24 (or maybe 29:22 depending on which version of race results you believe). Jeff McClellan set the blog record for the course with 30:13, but that was good enough only for 12th, and 6th Utahn after Seth Pilkington (29:07), Kyle Perry (29:20), Teren, Brad Osguthorpe (29:39), and Jon Kotter (30:07). Previous record was held by Paul (30:27). Afterwards Jeff and I watched the marathon backwards, and then I paced Mike Warren from about mile 20 to the finish. Then ran back to my car at the start of the 10 K.
Had an interesting incident. I felt thirsty so I decided to try some grape juice. Drank to much of it. Started feeling sick. Threw all of it up, it even went through the nose. Then I felt a whole lot better. P.M. 0.5 with Joseph in 5:55. Julia ran with Sarah (1.5 in 14:42). Jenny and Benjamin ran ahead and did their usual 2 miles. Benjamin 17:41, Jenny 17:50. Ran 0.5 with Sarah in 4:55. A.M. Ran the Uneventful Half with Jeff in 1:40:14. We were really dragging today. Both of us were tired from yesterday's race. First mile was 9:05, then it took us another 3 before we even started running faster than 8:00. After about 6 we started hitting 7:20s, and then both of us felt a whole lot better around 10. So we decided to run the last 1.5 at 6:00 pace and did it in 8:55, a little quicker. I felt good at 6:00, HR was 143, but felt very reluctant to go any faster, it felt like a magic spell. Then we did 2 more with Benjamin in 16:44 including a quarter in 82, which is Benjamin's PR. Then 0.5 with Joseph in 5:05, which is his PR as well. P.M. 1.5 with Jenny and Julia in 14:24.